You can purchase the Kids Wings unit for Hamster Magic NOW for immediate download for only $12.95! Includes a Jeopardy-type game. The Willow family has just moved to a huge, inviting country home nestled atop a wooded hill and overlooking a flowing stream. It should be the perfect place for four active children for a year while their father works on an important job for a year and their mother finally has a chance to paint pictures. The youngest sibling, Celia, is tired of being the littlest, the one who is blamed for everything. Now she is being blamed for letting Hammy, their hamster, out of its cage to run away. But she didn't. All she did was to try to teach him to open his cage door and then be grateful enough to say, "Thank you." When Celia hears a tiny voice squeaking. "Lemme out! Lemme out!" coming from inside a suitcase under the stairs, she finds the lost Hammy, and now she knows that Hammy can talk. Getting him to talk for her brothers and sister was another problem, though. When he finally agrees to talk to keep from being put back into his cage, he tries to bribe his way to freedom by offering to grant one magical wish. Four kids. One wish. As they try to decide on the one wish, Celia carelessly wishes that she were big. Wish granted! She becomes a big ... hamster! What happens next is a series of hysterical events that will keep you laughing and guessing what will happen. Hamster Magic is a perfect read-aloud for grades 1-2 and a terrific fantasy for third and fourth graders. The Kids Wings unit multiplies the fun and provides interaction through puzzles, group projects, an original readers theater script, problem solving that builds skills, and a Jeopardy-type game for the whole class to enjoy at the end. Hamster Magic will be a favorite addition to your home or school library! You can purchase the Kids Wings unit for Hamster Magic NOW for immediate download for only $12.95! Includes a Jeopardy-type game. Click here to Purchase and Download! A Kids Wings unit, perfect for lesson planning and handouts or projection on your SmartBoard for Hamster Magic is now available for instant download! Plus, an interactive Jeopardy-type game! Hamster Magic is included in the Kids Wings Reading Out of the Box collection of literature guides for award-winning novels and intermediate-level picture books. This collection comes in a spiral-bound book with CD and site license for one school. It contains 848 pages of activities in 25 titles PLUS a "Jeopardy-type" game for each novel! You can purchase a literature guide individually for around $12.95, but if you order Reading Out of the Box, you can get 25 literature guides for only $35, or less than $1.40 each! This is probably the best bargain in the USA, while quantities last! Your purchases through the Kids Wings and Amazon Links help to keep our website doors open! Disclaimer: The links here have been scrutinized for their grade and age appropriateness; however, contents of links on the World Wide Web change continuously. It is advisable that teachers and parents review all links before allowing student use. Please contact us immediately if you find any inappropriate links. 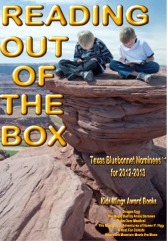 Disclaimer: Texas Bluebonnet AwardSM is a service mark of the Texas Library Association, which is in no way affiliated with Kids' Wings or Suzy Red. Use of the Texas Bluebonnet Award mark in these materials does not imply any endorsement of any kind on behalf of the Texas Library Association. The Texas Bluebonnet Book Master ListSM was selected by the Texas Bluebonnet Award Committee of the Texas Library Association.